For those living on or visiting the NSW coast (and into SE QLD) in the summer months, you will most likely encounter masses of the creatures of the blue layer. They are often found in huge numbers scattered on the tide line during northeasterly winds. The creatures of the blue layer or 'blue armada' drift across our ocean in huge surface floating clouds, feeding on each other and the vast array of oceanic plankton they pass across on their journey. There is a remarkable story related to this strange community. 'The blue armada' consists of groups of organisms from both related and unrelated phylums all have an interesting thing in common. It is their protective device against predation, a form of camouflage called counter colouring. Their upper surfaces are deep blue or violet, the same colour of the ocean surface to the eyes of predaceous sea birds. Their bellies or undersides pearly white, the colour of the ocean's surface as seen by predatory fish from below. A floating colony consisting of a number of different functional units, each with it's own special role to play in the survival of this floating stinger. There is a float polyp with glands that can inflate or deflate it. Dangling from this float are long tentacle like stinging polyps with poisonous stinging cells through out it's length, little vase shaped feeding polyps can be seen between the food catching polyps receiving prey brought to them by the long blue tentacles. Little fuzzy reproductive polyps are also easy to see. A special breed of Nudibranch that floats on the ocean film abides with the Blue bottle and has the same counter colour pattern. It feeds on the Blue bottle's tentacles capturing in the process un-discharged nematocysts (stinging cells) and incorporates them into one or more of the many cul-de-sac like branches of their intestines. These branches extend out into finger like process that not only enable the sea lizard to float but can be used as a means to discharge the pirateered blue bottle stinging cells for it's own offence of defence. The tentacles of the blue bottle regenerate itself after ingestion by the Sea lizard. 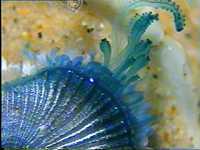 Related to the Blue bottle, it consists of concentric rings of air filled tubes, rimmed by a fringe of stinging tentacles. 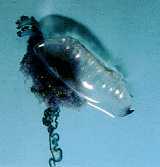 The air filled inner tubes maintain flotation whilst the tentacles kill and trap surface zooplankton such as copepods, crab larvae and minute fish fry. They are also counter shaded in blue and pale white. 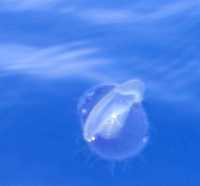 Similar to Porpita, it has an additional asset, a transparent sail that enables it to move itself and the colony along the surface of the ocean. It also has small short tentacles and stinging cells under it's pale under surface. These belong to a totally different group - the Gastropod Molluscs, a carnivorous snail. Its muscular foot creates a raft of bubbles held together by special waterproof glue that enables Janthina to float beneath the surface film. It too is camouflaged with a blue upper surface and pale below. When it bumps into a floating Cnidaria (e.g. Blue bottles, By the wind sailors and Blue suns), it will commence to devour the stinging tentacles of its prey with its rasp-like tongue.